I’ve created a list of my favorite 8 new technical features, my “gems". In this series of posts, I will show you them and dive a little bit into their technical details. In this sixth episode, we will talk about Tape Server. In Modern Data Center solutions, tape is no more a viable solution as a primary destination for any backup. Even more than the pure speed, it’s completely sequential access is a limiting factor for storing deduplicated backup files - especially when it comes to restore operations involving random I/O. No one will ever dare to run an Instant VM Recovery from a tape! And for the record, it’s not a supported capability. Disk based solutions have become the de-facto standard for primary backup targets, because they are the only ones able to guarantee the needed RPO and RTO values of an Always-On Business. This, however, does not mean that tape is dead, at all. Just like storage snapshots are not backups, but rather an effective first line of defense if combined and integrated into a multi-tiered data protection design, so are tapes. Disk storage is expensive, and it's often used to store few restore points as a source for fast recoveries. But nothing beats tapes when it comes to long time archival. If you want to extend your retention, tapes are a really effective solution. 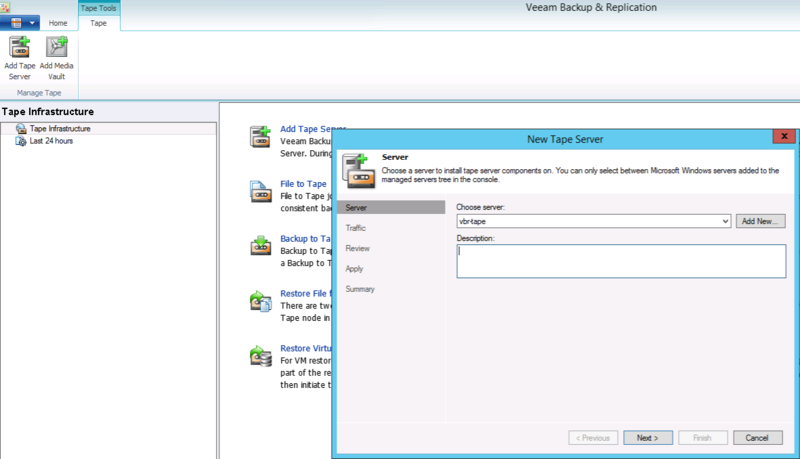 In Veeam Backup & Replication v8, we added a new dedicated role to our distributed architecture: the "Tape Server" role. The name totally explains its role: this Windows machine is directly connected to a supported tape library (direct attached or via iSCSI/FC fabric) and thanks to the new dedicated component, it becomes a "proxy" that is dedicated to manage reads and writes towards the tape libraries, and to drive automated or multi-tape libraries. As with any of the existing roles, it is up to you which machine to install this role on: a dedicated machine, a server running other roles, or the backup server itself - if you are willing to have an all-in-one deployment. 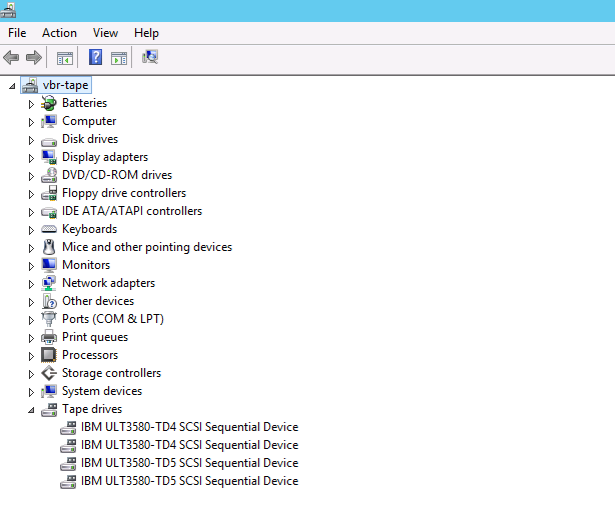 To set the Tape Server up, connect your tape library to the Windows server designated as your new Tape Server, and check that the tape library is correctly recognized in Device Manager thanks to MTF (Microsoft Tape Format) support. Note that if you see "Unknown Media Changer" or other unknown devices, you must install the Windows drivers provided by the tape vendor. With the dedicated Tape Server role, the Veeam server is now relieved of moving the data to and from tape, or requirement of being physical. Thanks to this, the server can be a control-only machine, maybe a VM protected by the high availability features of the hypervisor like VMware Fault Tolerance, while the Tape Server can be as near as possible to the tape library. 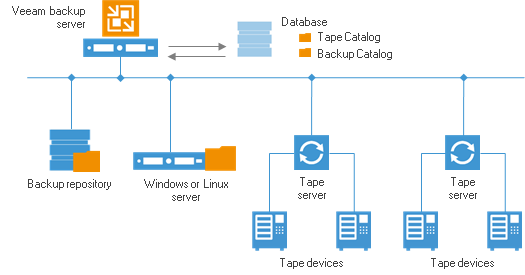 Any required tape server hardware can now be easily installed based on the tape library it will have to manage (for example, direct attached FC tape library), and the server itself can be sized accordingly to the expected load in terms of CPU, Memory and bandwidth. 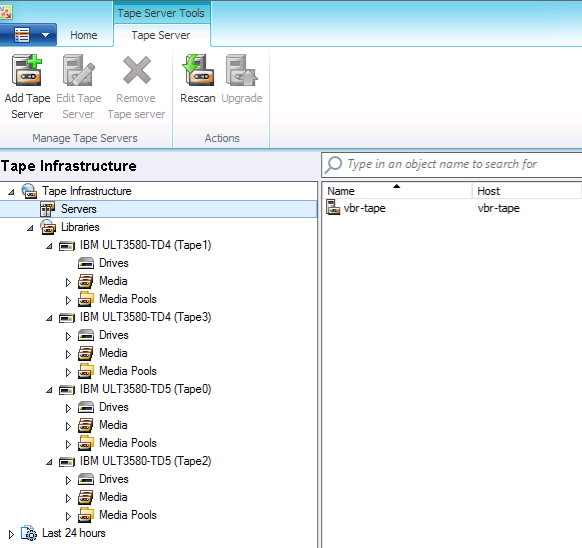 An additional benefit of the dedicated Tape Server role is that a single Veeam server can now manage multiple tape drives or libraries from different locations via multiple Tape Servers. The tape catalog will still reside in the main Veeam server, so if anything would happen to the Tape Server, it could be quickly replaced by a new one without any data loss. Tape information elements are now also protected by the enhanced Configuration Backup functionality, so they are completely safe. But it's not the only improvement to Tape management! We added for example Tape Vaults, that are logical containers where you can store information about offline tapes. The vaults are created by user and allow to virtually move the offline tapes to a vault, grouping them by any criteria. For example, if you have a number of offsite locations for physical tapes, you can create a media vault for each of them. When you transport the physical tapes to the offsite storage, you can accordingly move the offline tapes to a vault in your Veeam console, mirroring the physical storage unit. This functionality improves RTO by allowing restore operators to easily identify location of the required offline tapes, and swiftly file request for their delivery back to the data center. 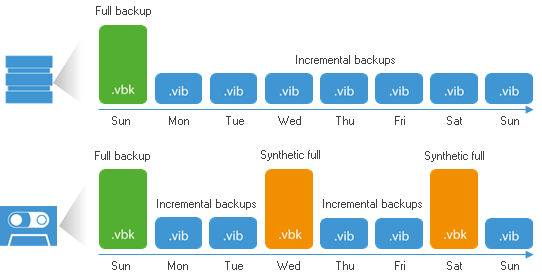 Finally, the coolest tape gem in Veeam Availability Suite v8 is Synthesized Full Backup for tape. With this new feature, you can create full backups directly on tape at desired frequency without requiring that primary backup job creates them on disk first! In the previous version, backup files produced by primary jobs which maintain only one full backup file on disk were not a good candidate for tape out - either because of requiring full backup written to tapes every time (for reversed incremental backup jobs), or due to forever-incremental job nature without periodic full backups (for backup copy jobs). But with this new v8 feature, you can now virtually "split" the existing backup file chain stored in the repository on disk into the smaller chains on tape - by Backup to Tape job synthesizing full backup file on-the-fly! And the best thing is that such synthesized full backup file will be transparently compatible with the following incremental backup files created by the primary backup job! Tape is an incredible solution for extending the retention and meeting the 3-2-1 rule in any data protection project. It's characteristics of durability, portability and cost efficiency simply cannot be matched by any other solution, especially for the companies who have already invested in the tape infrastructure. This is exactly why we at Veeam continue making major investments into our tape support functionality. Do you agree with our course? Please let us know in the comments!